A paralysed banking system and a lingering threat of exit from the eurozone would hurt any economy. Greece needs swift action to restore its financial sector, an end to all threats of Grexit, a bigger EU investment programme than currently planned, debt relief and a Greek-led cross-party plan on institutional reforms. Greece’s economy is in dire straits after months of political mismanagement and brinkmanship, which culminated in the closure of the country’s banks, the imposition of capital controls and the threat of expulsion from the eurozone. Such limbo would be toxic for any economy, but especially for a highly indebted one caught in an economic depression and in urgent need of reform. What Greece needs, however, might not be politically feasible, on the part of the Greeks or the rest of the eurozone – in which case it is worth considering whether it is in Greece’s interest to leave the eurozone. The first essential condition for continued Greek membership of the eurozone is a functioning banking system. The banks, deemed solvent by the new single European supervisor in its balance sheet screening exercise in October, are dependent on emergency liquidity assistance (ELA) from the ECB. The reason is that Greek banks cannot sell illiquid assets such as corporate loans as fast as Greek customers currently want to withdraw money from their accounts. The ELA is intended to stop such bank runs, by providing liquidity against banks’ illiquid collateral – something that is at the heart of any central bank’s mandate. The problem is that Greek banks’ collateral depends in part on the solvency of the Greek government: some assets are tax credits, others state-guaranteed. The ECB took the political decision before the Greek referendum to stop increasing the ELA, which forced the banking system to shut down. This has undermined confidence in the banking system, damaged consumption and investment, and made another recapitalisation of up to €25 billion necessary. Capping ELA was a very costly political threat that failed to impress: Greeks voted ‘Oxi’ to the creditors’ offer in any case. The longer the recapitalisation is drawn out because of lack of an agreement, the greater the damage to the Greek economy. What is more, it is still unclear what bank liabilities will be bailed in, apart from equity and unsecured bond-holders. If unsecured deposits are converted into bank capital, the Greek economy will take another blow. Unsecured deposits in banks are largely non-financial companies’ working capital. The recapitalisation must be done swiftly, and needs to spare deposits of any kind, to preserve what little confidence remains in the Greek banking system. Secondly, the threat of exit from the eurozone must end. In order to resume investment, firms, consumers and investors need to be sure that Greece will remain a member of the eurozone. A lingering threat of eurozone exit will kill any recovery, and could make the threat of exit self-fulfilling. But the very public suggestion by German finance minister Wolfgang Schäuble that Greece should leave the euro will not be forgotten – especially since he repeated it after creditors had reached a deal with Greece early on July 13th, apparently oblivious to the fact that he was seriously undermining it. To kill the exit threat, the creditors need to double the size of the EU’s proposed investment plan for Greece. 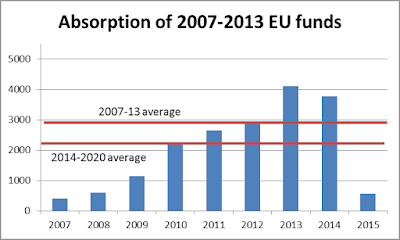 The EU aims to frontload and accelerate the disbursement of already agreed structural funds. While a good idea in principle, it will not amount to a stimulus, because structural fund investment was above average in both 2013 and 2014. Furthermore, there was no Greek austerity in 2014. The combination of above-average EU funds and the pause in austerity largely explains why the Greek economy stopped shrinking in 2014. The best outcome from frontloading EU funds would be a similar amount of investment as last year, which would not amount to additional stimulus, and would certainly not be enough to compensate for the fiscal tightening that the forthcoming memorandum of understanding (MoU) is likely to entail. 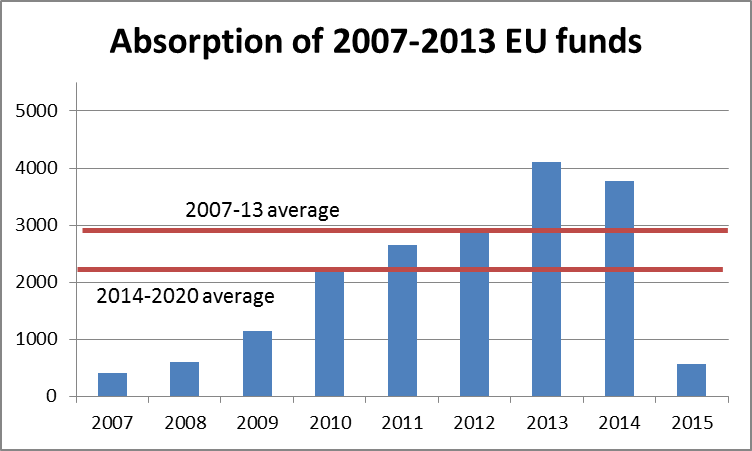 To offset this renewed austerity, the eurozone needs to increase the funds for investment from €35 to €70 billion over 7 years. Politically, EU leaders need to pledge more strongly that the eurozone is irreversible unless a member-state asks to withdraw. Angela Merkel would surely be criticised for such a pledge, since many in Germany see the threat of exit as a means to enforce discipline. But that argument risks take moral hazard too far, potentially making the threat self-fulfilling in a severe crisis. Another condition for Greece staying in the euro is political ownership by Greece of the reforms that are needed to unleash the growth potential of the country. The eurozone, knowing that the Greek political class is hostile to reform, is trying to micromanage the process and insisting that measures be taken before bail-out funds are disbursed (‘prior actions’). The problem, of course, is that Greeks cannot be forced to take ownership of reform. Moreover, the sort of institutional reforms that Greece needs will take a long time, and will not be sustainable unless they change the way the political system works. What is needed to reform the country is a Greek-led, cross-party plan on the key areas of reform – the justice system, land rights and registry, the public bureaucracy, tax collection, privatisation and deregulation of product markets. This plan would need the backing of a large proportion of civil society and ideally monitored by Greek experts, not the troika. Tsipras needs to be the leader of this broad reform consensus, and finally start delivering on the reforms he has promised. Such a Greek plan could then be supported by the rest of Europe through both financial and technical help. Relying on a Greek-led and Greek-monitored reform plan would of course ultimately be a leap of faith for the creditors, but after years of largely unsuccessful reform efforts in these key areas, such a leap is one worth taking. Debt relief is the final item on the list of Greek needs. Although Greek debt is mostly to official lenders and can be serviced on the current concessional terms, debt restructuring is still necessary. Greece cannot refinance its debt burden on the markets, so unless it is reduced to a level that investors believe is sustainable, the country will remain dependent on concessional funding by the creditors and the threat of Grexit will remain. Greece needs a clear, realistic and conditional debt restructuring plan so that its people have an incentive to implement the tough institutional reforms needed, and investors can be confident that Greece’s future lies in the eurozone. If growth stayed low despite Greek reform efforts, the plan would need to include provisions that automatically increased the debt relief. If these measures prove politically impossible, for either side, Greece may be better off outside the euro. After all, immediately before the bail-out agreement was struck, Germany seemed to offer relatively generous terms, including debt relief, technical assistance and humanitarian aid, if Greece agreed to leave. While such generosity reflects poorly on the motives of German negotiators, a managed and supported exit might be less painful for Greece than yet another unworkable programme, operating under the shadow of the risk of exit. For the eurozone, Grexit would be a political failure of epic proportions, and a large economic risk to take. It would surely be better to keep Greece in, with no ifs or buts.